We have to talk about popcorn for just a moment. 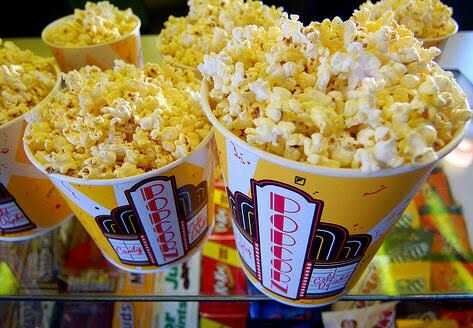 Popcorn is my frenemy. 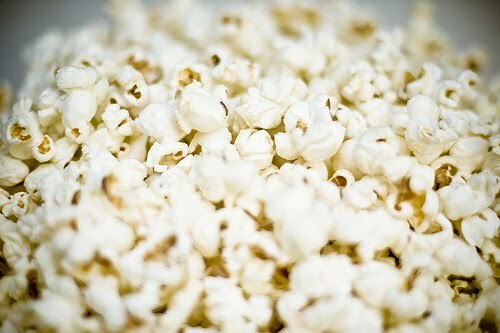 On the one hand, properly made and consumed in moderation, popcorn is actually good for you, and as a snack, a much better choice than chips or cheesy things. On the other hand, moderation is often hard to come by. Popcorn is one of those things I cannot ignore, if it is near me, even BAD neon-yellow-overly-salt-slightly-stale bar popcorn, I am powerless to its siren song. At movies, despite my best efforts, the bag never much makes it past the first ten minutes of the film. Growing up, and even today, my dad always made the popcorn. Pretty basic, just oil and popcorn and salt, served in one enormous woven wood bowl, with little individual bowls on the side. Plunking down in front of the annual showing of Wizard of Oz, or the latest episode of Hill Street Blues, those perfectly popped kernels of goodness were the best possible couch snack. When the microwave popcorn fad started, I was perplexed. Popcorn takes like five minutes on the stove. And doesn’t taste of chemicals. Why would anyone buy that? Over the years I have taught many friends to make popcorn “from scratch”, and they are always amazed at how fast it is, and how much better it tastes. My version is pretty basic. Stockpot with good lid on over high heat. Eyeballed 3 T of peanut oil, canola in a pinch. ¾ c O rville Redenbacher popcorn kernels. (yes, Orville Redenbacher. I have tried others. This one is the best. Full stop.) Dump into pot and swirl to be sure the oil coats all the kernels. Plunk on cover. Wait for popping. Don’t touch. When popping slows from roiling explosions to gentle occasional pops, remove lid, and give one shake just to get the last few popped. Dump in bowl and salt to taste. If it takes you more than five minutes start to finish, I’d eat my shoe. Reason #74 on the list of why I love this man. I went to the kitchen. Five minutes later, I came back. One bowl. Two hands, bumping into each other occasionally. Crunchy, salty, easy. The bowl is definitely more satisfying when shared. He told me it was the best popcorn he had ever had. And even though it didn’t taste any different than the gazillion other times I had made it, he was right. It was the best popcorn I’d ever had too. Want to gild the lily? Try one of these recipes. In a large saucepan, melt the butter. When it has stopped foaming, stir in corn syrup, sugar and salt. Bring to a boil, stirring pretty constantly. Once it begins to boil, stop stirring and let cook for 5 minutes. Remove from heat, stir in the soda and vanilla very carefully, as the mixture will foam up and expand. Put the popcorn in a large mixing bowl. 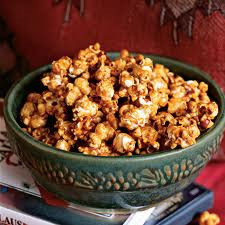 Pour the caramel over the popped corn and mix well. Sprinkle the almonds in and give one last mix. Spread the corn onto buttered sheet pans and bake for 40 minutes, stirring every 10 minutes. In a small saucepan, heat the butter over medium high heat until the butter solids go a lovely golden brown, but don’t let it burn. Should smell nutty. Remove from heat and reserve. Make popcorn according to directions above. Drizzle browned butter over popped corn, tossing to combine. Sprinkle with sugar and toss well, then salt to taste. I make homemade caramel popcorn all the time for my daughter's school events. It doesn't contain any of the most common allergens, it's cheap, it's whole grain, it's portable, it doesn't make a mess (that isn't easily picked up), and the limitations to packaging it are only found in my imagination. Popcorn balls, popcorn sticks, popcorn cones...you name it I've made it. I love all of these recipes and can't wait to try them! That's it. This weekend. I'm poppin' my own, and my kids will think I'm a hero. My grandma used to do it (and we'd watch Lawrence Welk), but my mom used one of those air poppers, and I guess micro popcorn tasted better than the air poppers. The caramel corn looks to die for. The Herbed Popcorn sounds delish!! Although I am certain to burn my mouth as I am not able to wait for anything to cool. Every since I got a Whirly Pop on the stove is the only way I'll make popcorn! It's takes no time! And I always sprinkle a little parmesan on top as well. DELICIOUS! All good stuff. But the critical element that is missing is the type of popcorn: white. White popcorn is not the norm in the stores. You must seek it out. And you will be rewarded with an even lighter and crunchier experience! Jolly Time makes the most popular commercially available variety. Bob's Red Mill also offers white popcorn available at Whole Foods. Choose white, not yellow, and you shall be rewarded. I agree with you, there is no substitute for 'popcorn from scratch', I started making it when I lived overseas and couldn't get microwave popcorn....then realized what I'd been missing. My weakness is that I can't refrain from melting half a stick of butter and pouring it over the top with a healthy (ha!) dose of salt. I made your herbed popcorn several months ago after you wrote about it...very tasty, indeed. I was glad to have found a use for the yeast powder that I had bought on a whim. However, I managed to burn it onto my dutch oven. No matter what I did, the black stuff wouldn't fully come off! I finally just ignored it. Only about a week ago did I finally got it clean. Be careful, chickens, if you burn it, that stuff is the most tenacious super-glue of pot gunk ever. NASA could have used it to adhere tiles to the space shuttle.